What is Emotionally Focused Therapy (EFT) for Couples? EFT is a short term therapy for couples which typically takes 8-20 sessions. Many couples will fall into a negative pattern or cycle of communication. When an argument starts off with a towel being left on the bathroom floor and then escalates into ,"Your mother does such and such" it's not really about the towel left on the floor. EFT helps couples identify their negative pattern of communication, tools to get out of that pattern, and create the secure bond they're really looking for. Susan Johnson is the main Pioneer Developer of EFT and gives a brief description of what it's like. 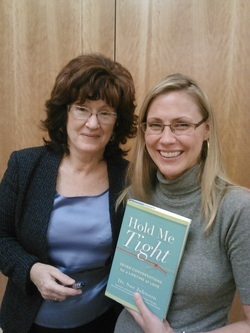 "Hold Me Tight" is the first book available to the general public on Emotionally Focused Therapy (EFT) for couples. If you would like to purchase a copy. Click the book icon to right. It's available in hard cover, Kindle, and Audio. Photo the left: Dr. Susan Johnson gave a presentation in UT to a group of therapists and students.